The JK Wrangler 2 Door Rear Flare Mounting ExoSkins provide additional strength to the vulnerable rear wheel well opening. 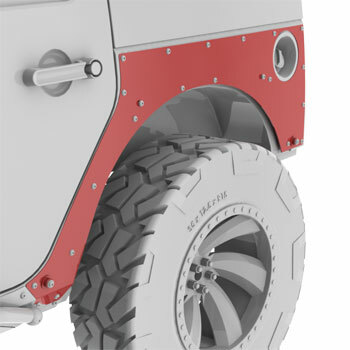 Designed specifically as a mounting system for Quick Release rear flares, the flare mounting hardware is built right in. Rock-Biting Rear ExoSkin, designed to mount the Quick Release Dovetailed Flares. 1/8" Cold Rolled Steel Plate creates protection and the ability to add a Rear Flare. The weak body of the JK requires the use of the rear ExoSkin so that we can raise the Dovetailed fender and gain all that additional clearance! We strive to make all our products easy to install. The corner guards require special drilling and some body modification, making them a little more challenging than our fenders, but still the easiest in the industry.